Rev up this August with some hot exotic cars! 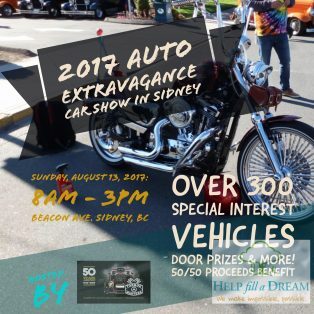 Help Fill A Dream is proud to announce we are the charity partner for the 2017 Auto Extravagance Car Show in Sidney, hosted by the Torque Masters Car Club and Coast Capital Insurance. Over 300 classic and special interest automobiles will be gathered on the streets of Sidney on August 13, 2017, featuring awesome paint restoration jobs, shiny chromes and polished aluminium on cars, bikes and trucks. And be sure not to miss out the variety of automotive related vendors including Anavets – Sidney Beer Garden, a live panel jam and the 50/50 draw – where the funds from the raffle draw will benefit Help Fill A Dream’s programming! And this all starts on the corner of Beacon Ave at 8:00am, August 13, 2017! Register today and get your tickets for the 2017 Auto Extravagance Car Show by clicking here. And for more information about Auto Extravagance Car Show, please click here.